Book Description: This first-year geography textbook takes a holistic approach to geography by incorporating elements of physical, human, and regional geography, as well as bringing in methods and perspectives from spatial information science. This textbook applies a fundamental geographical approach to understanding our globally changing world by looking at local processes, which are linked to larger global processes and events. The textbook includes numerous case studies specific to British Columbia as well as a number of suggested service learning activities. Over the course of four days in June, 2014, five faculty members from across British Columbia supported by a facilitator, librarian, researcher, illustrator, programmer, and instructional designer created this book. This involved drawing on our own research, teaching, and experience and working with the team to put it all together into an online format; one which would be accessible to students and educators alike. Beyond the unique way in which this book was created in a book-sprint process, there are other elements of this book that make it unique. First, it takes a holistic approach to first-year geography, incorporating elements of physical, human, and regional geography, as well as bringing in methods and perspectives from spatial information science. Pedagogically, this book incorporates elements of service learning and suggested service learning activities, recognizing that the study of geography is deeply connected to the communities we live in. Many of the suggestions for service learning are illustrated through the use of case studies from across BC. The book is aimed at a first-year or introductory geography student and would be suitable for a first-year geography course on BC. 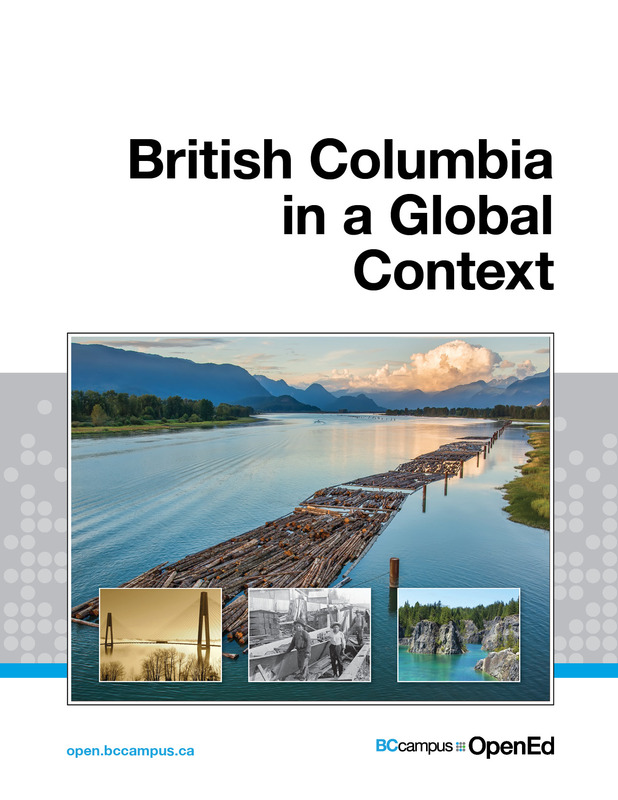 British Columbia in a Global Context by Geography Open Textbook Collective is licensed under a Creative Commons Attribution 4.0 International License, except where otherwise noted. Britsh Columbia in a Global Context by Geography Open Textbook Collective is used under a CC BY 4.0 International Licence. Geography Open Textbook Collective. (2014). British Columbia in a Global Context. Victoria, B.C. : BCcampus. Retrieved from http://opentextbc.ca/geography/. Pitt River Bridge View by James Wheeler is used under CC BY-NC-SA 2.0 Licence, Natives making a canoe from a tree trunk at Mission, British Columbia, circa 1900 by BiblioArchives is used under a CC BY 2.0 Licence, Heisholt Lake by David Stanley is used under a CC BY 2.0 Licence, and Skybridge, British Columbia by Troy Wason is used under a CC BY 2.0 Licence.